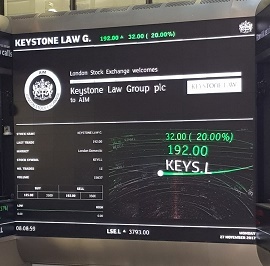 Keystone Law made its debut on the London Stock Exchange yesterday and saw its share price jump 20% in the first day of trading. 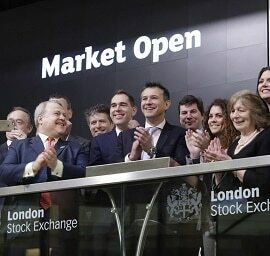 Admitted at 160p, the shares closed at 191p, having gone as high at 196p. Keystone was valued with a market capitalisation of £50m, following an oversubscribed £15m fundraising. Some £10m was raised for the company, comprising £9.4m by way of the placing and £600,000 through the issue of subscription shares, with £5m raised for the selling shareholders. Chief executive James Knight told Legal Futures last week that he and two other shareholders had sold the 10% stake in the business to provide greater share liquidity. Keystone has given two main reasons for going public. First, it would increase brand recognition “whilst lending further credibility to its offering to both clients and lawyers, thereby enhancing the group’s future growth potential”. Second, the net proceeds of the placing would be used primarily to redeem the outstanding amount of the loan notes held by certain of Keystone’s existing shareholders totalling approximately £7.4m, which would leave the group debt-free following admission. The firm intends to use the rest of the capital in order to support its growth strategy which will, in the short term, focus on organic growth. However, the listing document said that, longer term, “the board believes that suitable acquisitions of smaller businesses, with similar business models but strengths either in specific geographical or niche legal practice areas, may present options to accelerate growth further”. Meanwhile, the UK’s first listed law firm, Gateley, issued a trading update yesterday ahead of publishing next month its interim results for the six months ended 31 October 2017. It said activity levels have been “robust and this, together with particularly strong growth in Gateley’s corporate and property service lines, has yielded revenues up 10% over this period”. The firm told investors: “The board generally sees activity levels remaining solid and continues to invest in the business, taking advantage of growth opportunities as they arise. The board said the full year looked like being in line with market expectations. Chief executive Michael Ward said: “In line with our overall growth strategy, we have continued to take advantage of our brand recognition opportunities, service line enhancements and the delivery of excellent levels of client service. “We continue to invest in our people through the release of further share incentive option schemes where participation remains strong across professional and support staff alike.